Anyone who follows this blog or visits the site often may already be well aware of my newfound love for Linwood Barclay. 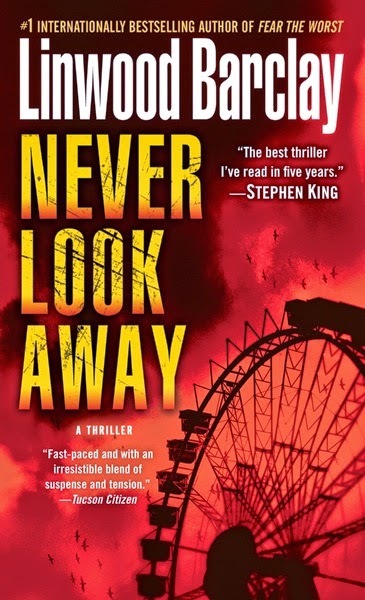 I recently purchased Never Look Away from Amazon while on a Barclay buying-binge, and couldn't wait to dive right into it. I would have finished this novel about a month and a half ago had review deadlines for other new releases been nonexistent. Never Look Away opens with newspaper reporter David Harwood visiting a local amusement park with his wife Jan and their 4-year-old son Ethan. Shortly after arriving at the park, Jan goes missing, and David immediately calls the local Promise Falls police to report her disappearance. David soon learns that not only has Jan disappeared without a trace, but that there is no record of her entering the park, and that Jan is not his wife's real name. As if that weren't enough of a kick in the head, David becomes the number one suspect in his wife's disappearance, which the townies are now starting to regard as a murder. David then goes on a crazy, wild goose chase to learn more about his wife's background, and about why he is being set up. Just as with all of Barclay's novels, there are no dull moments from start to finish in Never Look Away. However, I found this one to be my least favorite of all Barclay's novels I've read to date. First of all, Never Look Away is not written completely in first-person from David's point of view in the manner of all the other books. This novel is also told in third-person from the viewpoints of the fat sheriff Dumbleduck (or whatever his name is) and that of other various characters, which slightly ruined it for me. Second, I felt that Barclay's reveal of the mystery behind Jan's disappearance occurred too soon, and I didn't feel as if there was much left to figure out for the latter half of the book. I was disappointed that I had figured things out early on, but of course it didn't stop me from speeding through the rest of the book. What I did love about Never Look Away, and what I always love about Barclay's novels, are his amazing male protagonists. They're everyday men with a sarcastic sense of humor and I can't help but crush on them throughout my reading of these books. My favorite part of Never Look Away occurred near the beginning where David complains to a coworker about the terrible translations of news stories being provided by outsourced writers in India. I also loved how this book's setting was Promise Falls, which I became familiar with in Too Close to Home. I'm sad to say that this book probably won't be sticking in my head for too long, but even so, I would still give it four out of five stars. The ending was cheesy too, but at least it was satisfactory. Next up on my Barclay reading list is The Accident.